This tutorial explains how to stop truncation in character variables while importing CSV or Tab files with PROC IMPORT. It is a common issue when your CSV file has a character variable having inconsistent length such as open-end comments, company names and addresses etc. 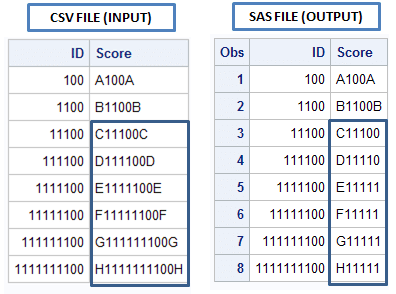 By default, SAS scans 20 rows to determine the appropriate data type and length for the columns. The sample data is shown in the image below. 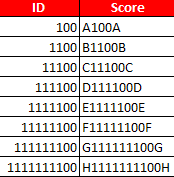 We have two variables named ID and Score. ID is a numeric variable and the Score is a character variable. The numeric variable "ID" didn't get truncated. However, the character variable Score got truncated. 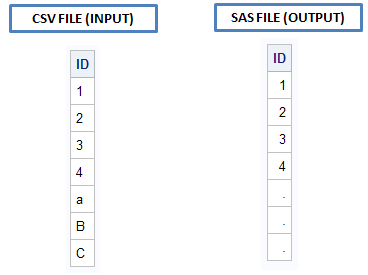 As we have defined guessingrows=3, SAS considers the length of the character variable based on the third row (including header row) of the respective variable. For demonstration purpose, we have used guessingrows=3. If this option is omitted, SAS would scan first 20 rows. The simplest way to fix this issue is to use the higher number in GUESSINGROWS option. In SAS 9.2, the maximum value of GUESSINGROWS is 32,767. Should I use GUESSINGROWS= MAX for simplicity? It depends. If your file is heavy and contains hundreds of thousands of records, it would make the import process VERY SLOW. You might find that earlier it was taking 20-30 seconds to import the file when you were not using GUESSINGROWS= MAX. Later it is taking 5-10 minutes to import it. If your file is short, don't hesitate to use GUESSINGROWS = MAX. Step 2. Copy the generated import code from the log to your program, remove the line numbers. Step 3. Change width of the Score Variable from 6 to 30 in both INFORMAT and FORMAT. It's done! It is useful if you have both character and numeric values in a variable and the first 20 observations are all numeric and the remaining observations are character values. So SAS would make all the character values blank. 0 Response to "Avoid Truncation in PROC IMPORT"